Our friendly team of staff are here to help with any bookings or queries you may have. Our Professional Coach Tour drivers really do go that extra mile to ensure you get to your chosen destination safely, comfortably and happy. 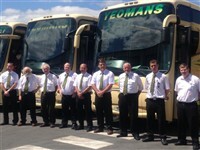 At Yeomans we know that it is the driver who really makes your holiday complete and our drivers are renowned for their helpful attitude and care and professionalism whilst driving.